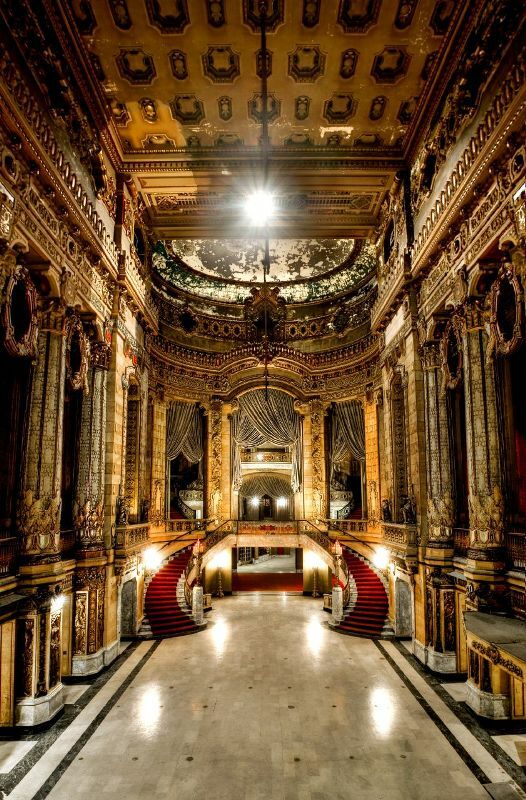 Seems my recent blog post on my dream production of Follies, as staged in the lobby of the Uptown Theatre, has hit a nerve. It’s quickly made the rounds, and I’ve received some lovely and supportive emails from people who’ve visited and raved about the space, have somehow been connected with the Uptown throughout its storied past, or simply wanted to express how much they liked my idea. One of those emails came from the Uptown’s facilities manager who offered me the opportunity to tag along with a tour arranged for Art Institute of Chicago students, who were studying the space for their restoration class (or something like that). So before I headed into work yesterday, I took a detour uptown to tour the Uptown. At 9 a.m., we all gathered under the Uptown’s marquee, and were greeted by three men: the owner, the facilities manager and some guy who led the tour (whose name escapes me) who knows all there is to know about the Uptown. We were then led into the lobby. Wow. The place is a castle. The photo I included in my last post is pretty representative. It’s a glorious, fading jewel. As I stood in the center of the lobby, I couldn’t help but imagine my dream Follies. I pictured gloriously decked out tables — like a party — arranged in the lobby. And that’s where the audience, and the actors, would mingle and sit. As for the orchestra, I was pleased to learn there’s a space on the upper level, just above the entranceway doors, where a band used to play while people mingled in the lobby during the theatre’s heyday. A band in the lobby? Yes. The Uptown was the hub of the thriving Uptown cultural scene. In 1925, when the Uptown opened, the red line’s Lawrence stop was the hot spot for dining and entertainment. Shows — both live shows and movies — played all day at the Uptown, and the lobby offered a place to shop, eat and hang out while you waited for your show — which explains the lobby’s size. In addition, you could even leave your children at a nursery area (which we also toured) as you enjoyed the show. It seems they thought of everything! Furthermore, the auditorium isn’t in nearly the dire state I’d anticipated. There is hope! And the stunning Spanish Baroque architecture still packs a wallop. Interestingly, an area in the back corner of the space that was all blackened and soot-stained was actually the artifact of Hollywood magic. The film Backdraft used the Uptown’s auditorium for a few fire rescue scenes, and black paint was applied to create a charred appearance. Of course the Uptown is in need of major love and care. The plaster’s crumbling and water damaged in areas due to years of neglect, the wiring needs to be redone, and I’m not sure what else. Also all the chairs need to be replaced in the auditorium (not just because the upholstery’s disintegrating, but because we have wider asses now then they did in the 1940s when the Uptown had its last major renovation). I’ve heard up to $70 million are needed to restore the Uptown. I wish them the best of luck in realizing their dream (as I continue to mull over my Follies dream). Wow! Thank you for this post. I am swooning at the thought and the dream of your Follies. How exciting is this? I hope your dream comes true. Thanks! A dream is a wish your heart makes. Or so I’ve been told. I used to live only 4 blocks from the Uptown, and dreamed of going inside. I’m so jealous! And maybe your dream could help with the renovation–in my hometown of Cleveland during the 1970’s, people were trying to renovate the theatres of Playhouse Square downtown. One of the ways they raised money and interest in the project was by staging a production of “Jacques Brel Is Alive and Well and Living In Paris” in the lobby. It was a huge hit, running well over a year and spawning a cast album, and got a lot of people excited about Playhouse Square. Five theatres have since been renovated, and the whole complex is gorgeous. So maybe a lobby “Follies” could help? Thanks for your words of inspiration, Zev. The ’70s were a much different time, but I’d like to imagine a lobby “Follies” is the answer to all life’s problems. And of course the four-actor “Jacques Brel” is a slightly more efficient way to raise cash than Follies, which probably needs, what, 40 people in the cast at least? I hereby volunteer to sew sequins on dresses for that production. I’m there. Just a little correction, the elevated train (Red Line today) didn’t end at Lawrence in 1925, the northern terminus has been Howard since 1908 (as evidenced by the vintage stations all along the north side branch, most still in use). Lawrence was a busier stop in the 20s though than today. Thanks for that insight, eje! I probably heard the tour guide incorrectly. I’ll update my blog post. SO, I wonder if the Owner of Uptown Theater should have a Fundraiser to Earn Money to Fix Up the Theater? Like for Example, he should Open the Uptown Theater Doors to have Visitors to See the “Before” Condition and Each one of us Pay $10 for the Tour. Then all that Money goes to the Restoration Fund. And then when that Money is at it’s Peak then they can go ahead and start Renovating it? Ideas? That seems the logical solution, doesn’t it? Tours of the Uptown? I’m wondering why they don’t do that. There has to be a reason — like they have to get permits of some sort to hold public tours, etc. Thanks for sharing! I really hope this gem gets restored. Like many have mentioned above, I dream of having the same opportunity! Your photos and description of the space makes it sound breathtaking! I agree. They should offer tours of the space, with funds being contributed to the restoration fund. I know I’d be one of the first ones in line for that! I’ve lived close to the Uptown for a few years and have long hoped that someone would fix it up. Sadly, I think it’s going to take a lot of $ to do that, and then what would they use the space for? In any case, thank you so much for sharing your inside look at interior! I wish more people had the opportunity to do a tour – maybe that would drive more interest in its restoration? Just a few corrections in the interest of sharing information nicely: The building’s new owners have been at it for more than two years now (see Crain’s); the Uptown has not been without power any time we can recall since 1998 and we are not aware of it being shut off prior to that except maybe for repairs; volunteers pulled almost all of the carpets out nearly 20 years ago, and other debris has been hauled out steadily ever since (large, vacant buildings have a habit of collecting “stuff” just like your closet and basement); the musicians’ gallery space on the mezzanine level of the grand lobby certainly contained a reproducing piano and perhaps small musical ensembles (likely union) at one time early on; concessions were not introduced until much later so there would not have been shopping or mingling in the lobby originally — that space is intended to line up standees for the next show; in a contemporary use, the lobby could be used for all kinds of merchandising and amenities; the seating on the floor is 1940s; the seating in the balcony is original; and…essentially no one in their right mind would renovate a theatre without replacing the seats in a size befitting the Modern American and with all of the comfort needed to enjoy a long production and a cupholder to hold a tasty beverage! 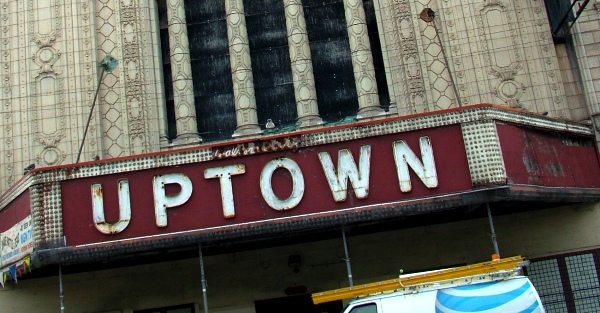 Thanks for your firsthand account of a tour the Uptown Theatre, Chicago. And thank you for chiming in with your expert insight! There was a lot of information to absorb in the tour, so I’m certain I mucked up some of the facts. If they would allow tours I would volunteer to be a tour guide for free. No overhead! When you cast “Follies,” remember that I would make an AWESOME young Ben. Or an older Sally. I’m very versatile that way. Or, you know, Donna McKenchnie would suffice, as well. Meh. I saw her in A Little Night Music a few years ago. She stills sings as flat as she did when she recorded A Chorus Line. I saw Eartha Kitt as Carlotta in London in 1988. She was SPECTACULAR. And the best Sally I’ve ever seen (aside from the delicately nuanced performance I’ll give, of course) was Victoria Clark in the Encores production in NYC a couple years ago. I am SO glad to see this documentary made and this effort gaining momentum. I used to live in Andersonville and always lamented the demise of that theatre. CHICAGO! Let’s get behind this and put Uptown Theatre back on the map! I love this place. My uncle, who will be 98 on the 10th of November, worked there in the 40’s and I worked there in the 80’s. There really is nothing like it. Chicago magazine once called it an acre of seats and a field of dreams, and they weren’t far off. Glad to hear someone thinks it’s not totally hopeless. Until what year did you work there? I thought it closed in 1981. If they *really* wanted to publicize the Uptown, they would make that documentary free of charge. Funny that the trailer keeps saying ‘We need more people to see this theatre!’, yet you have to *pay* $25 for the DVD. If they really wanted the Uptown restored, they would find a way to release it free of charge. Hell, if they’d let me I’d *love* to direct a doc of the Uptown to go with my upcoming series of Chicago-based documentary vignettes. And it’d be free for all to view :) Maybe I’ll try to contact ’em…. The film is for free – at least, you can stream it from Vimeo. The difference you pointed out is that the video showcases the volunteers and their ideas. Not having tours has been the choice of a succession of owners. The documentary was produced by students, free of charge. No one duplicates DVDs, packages them and ships them for free. That was the cheapest it could be done at the time. As technology and access improved, the filmmaker uploaded it to Vimeo. It would fantastic if the Uptown could be restored. The Aragon Ballroom (nearby) offers about the same size venue, but with terrible acoustics. The Uptown could fullfill the same crowd sizes, but from a much cooler view. I’ve heard the only theater bigger (in the US) is Radio City, in NY. Before any restoration, the politics of the downtown theater district would have to be worked out. They don’t want to see another large venue in competition with the Cadillac and Oriental. The Aragon was built as a dance hall. It has a special spring suspension in the floor so you could have capacity crowd of 8000 people doing the polka on it. It was never meant to be a concert hall. It was designed by John Eberson. The Uptown, a Rapp and Rapp design, still has the same two problems it has always had. Not enough places to park, since everyone drives now, and no room behind the theatre to unload and handle stage equipment. It backs right into St. Boniface cemetery. My mom used to work in the cemetery office. There is very little room back there. It was definitely the largest theatre in the States until Radio City was built. The Uptown had had 4,381 seats, a 70 x 50 ft. Proscenium, and six public lounges. Ther’es another good discussion going on about the Uptown at the site Cinema Treasures. The Aragon’s capacity was never more than 5,000. The Uptown borders Magnolia Avenue. On the west side of Magnolia is a small parking lot and a block of houses, which abuts the cemetery. I keep hoping that someone, somewhere will really save the Uptown. It was a truly amazing place, and there will never be the like again, esp, if it isn’t saved. The last concert I attended there? Seeing the Grateful dead in the late 70s. I started working for ABC Great States in 1973, and stayed with them when Plitt took over. I bopped around a lot. I was at the Chicago, the Nortown, The Esquire, the Uptown ande a few other places. I can’t give you an exact work history after all this time. The last year I was at Plitt WAS probably 1980 now that I think about it. I know I was at the Uptown for awhile the summer Terry Angelidis was the manager, and I did some of the concerts, including the Bay City Rollers. I helped serve the lunch there when the THS had their conclave in Chicago in ’77.